Developed in partnership with Westbank, 700 West 8th fits seamlessly into the urban fabric of Vancouver’s Fairview Slopes. 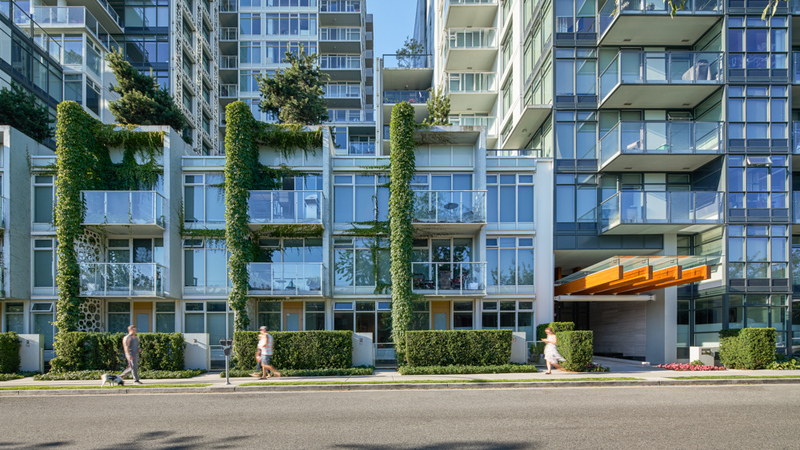 The project required a lengthy rezoning process with an end goal of contributing to Vancouver’s ecodensity initiative—and helping to bring a new community of people within walking distance of the shopping, offices, entertainment and transit located along the nearby Broadway and Cambie corridor. Two adjacent towers, one at 17 storeys and one at 12 storeys, offer 128 suites, including 10 townhouses, six non-market senior’s apartments and 106 market residential units. A series of green walls and landscaped terraces and roofs are woven throughout the project with a large pool located in the central courtyard. Sustainability features include geothermal heating and cooling, rainwater retention and solar shading. Extensive planting walls throughout the building’s façade reduce heating and air conditioning demands.